As you know, we like to seek out great competitions for you on the social web and let you know all about them. 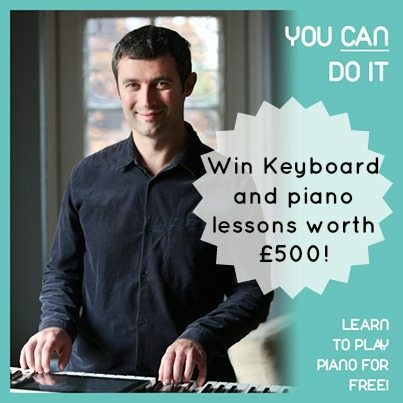 This competition from DecPlay Piano really caught our eye. We love encouraging musical endeavour in our house; from letting the kids stay up late to watch Strictly to enduring Chatterbox’s violin playing…. 3 hours of online coaching by the founder of DecPlay! Even better, every entry receives a free song sheet as well. To enter, nip on over to DecPlay’s Facebook pages at their competition tab and follow the instructions. Terms and conditions are here too. The closing date for the competition is Monday 31st March 2014. Perhaps you could be one of those million if you win this great prize? Don’t forget to nip over to our other open giveaways as well, and even bookmark our competition listings page so you can keep coming back to check the best of the competitions on the web for families. This is a sponsored post. This rules for this competition can be found here.